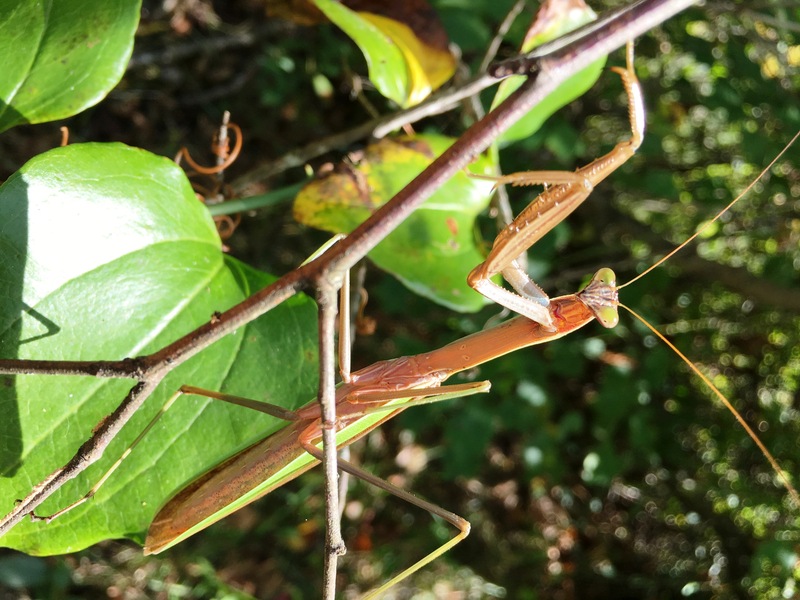 Friday, September 22, was an unusually warm and muggy fall day, but we adjusted our layers and started out on the famous warbler trail in the heart of Jackson Park in Hendersonville, NC. American Redstarts were the bird of the afternoon. Although we saw several males, we mostly saw females and juvenile males in their yellowish plumage. The black-dipped tail helped us identify the Magnolia Warbler in its fall attire. Swainson’s Thrushes and American Robins fed on the Virginia Creeper berries throughout the park. Susan Andrews was our resident botanist, educating us on the native and invasive plants along the trail. 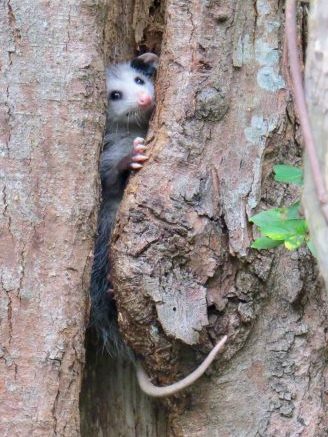 Our curious, enthusiastic group of nature lovers enjoyed the wildflowers, moths, butterflies, praying mantis, and especially the cute baby possum that we found. We checked into the Cedar Wood Inn in the late afternoon and then simply crossed the street to the Flat Rock Wood Room restaurant for a yummy dinner! After a continental breakfast at our motel, we headed back to Jackson Park. First, we walked the loop around the ponds. A beautiful Canada Warbler hopped up from the flowers thrilling us with great looks! 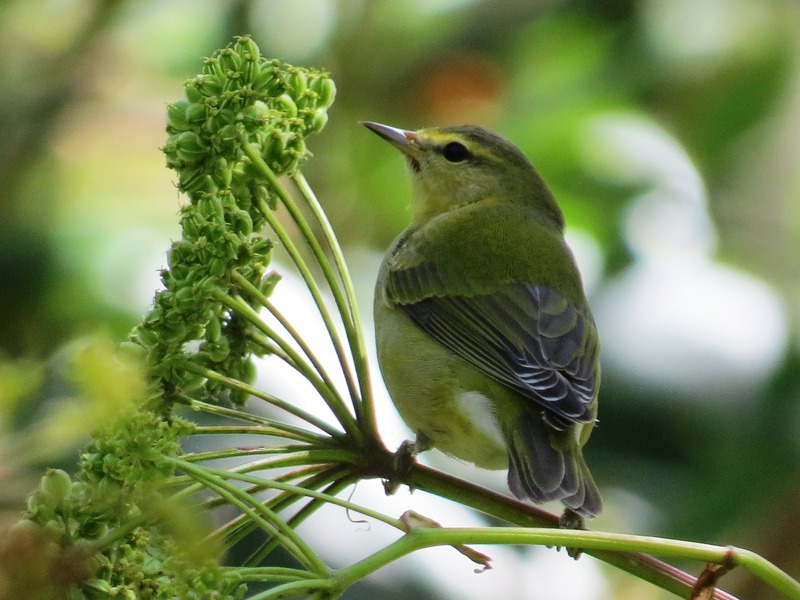 Then we walked the warbler trail again – even though an earlier group reported that they had not seen much… Once again, the Virginia Creeper vine was hosting Swainson’s Thrushes and American Robins as well as the thrill of the day: two Philadelphia Vireos! 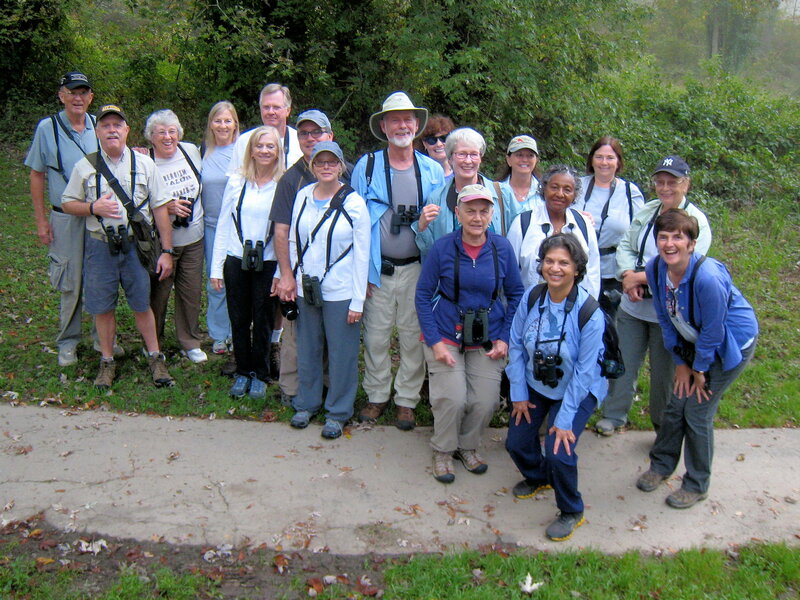 The vireos were life birds for many of the observers. By the time we went to the Beaver Lake Bird Sanctuary, the temperatures were even warmer, but even an afternoon shower could not dissuade us! A flock of Cedar Waxwings provided an opportunity to study the striped juveniles. Two shorebirds could be seen on the exposed shore of the very low Beaver Lake: Semipalmated Plover and Spotted Sandpiper. 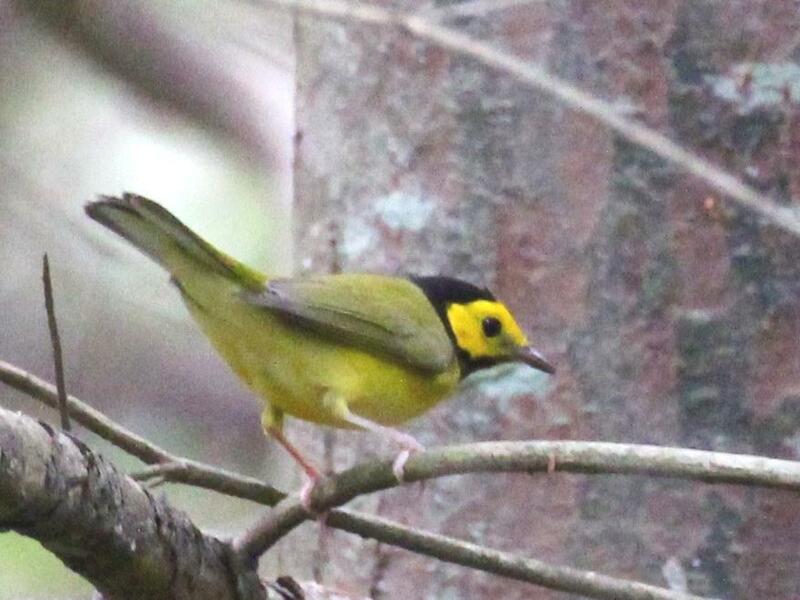 A Hooded Warbler played hide-and-seek with us until we each got a great look! We walked the boardwalk and then headed to the cars as a large storm approached. We skirted the edge and mostly saw the effects of the wind as thousands of fall leaves danced in the air! Our dinner locale was Stony Knob Café. After a fabulous meal in this eclectically decorated restaurant, we headed to our hotel for a good night’s sleep. After entering the private community of Wolf Laurel Golf & Country Club, we drove up Big Bald Road to the parking area. 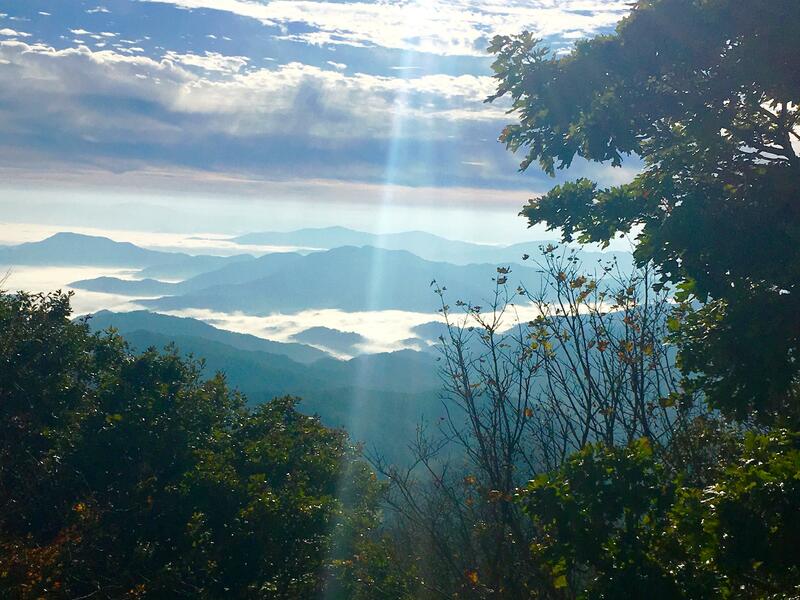 We carried our chairs, lunches, and gear to our “camp-out” spot in the gap between the two balds, a few feet away from the Appalachian Trail. Then we hiked a short way on this famous trail to Little Bald to visit the Big Bald Banding Station, a project of Southern Appalachian Raptor Research. 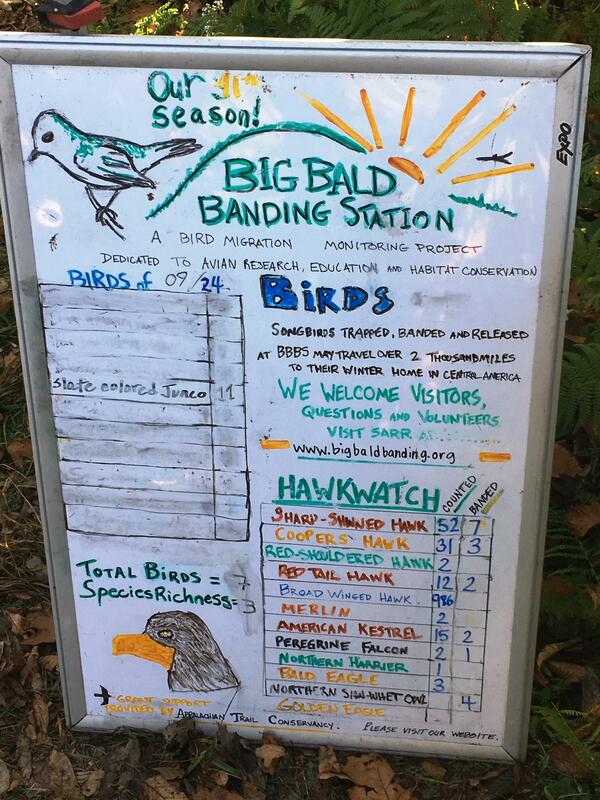 Mark Hopey, the director of the MAPS (Monitoring Avian Productivity and Survivorship) project on the bald, welcomed us and spent the next few hours telling us about his passion for birds as he banded, weighed, and measured dozens of birds. Under the guidance of the volunteers, we checked the nets and transported the birds back to the banding table. 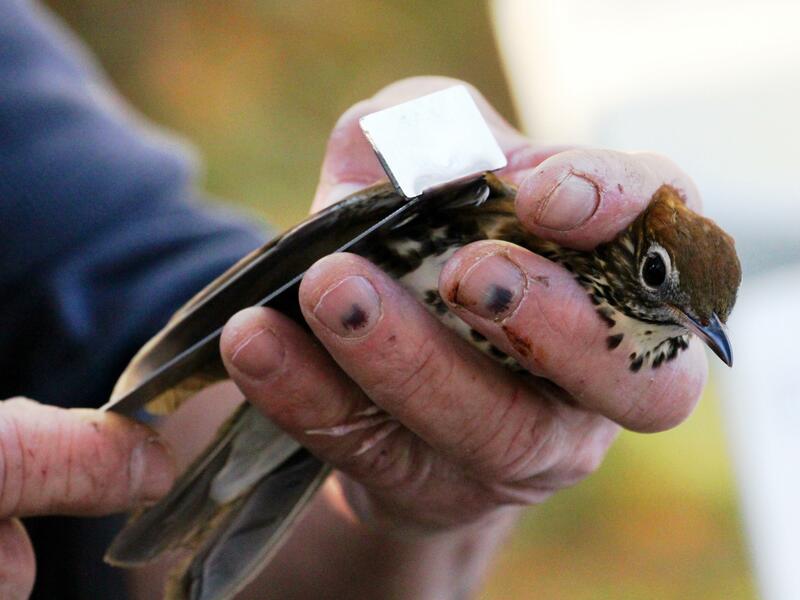 Barb was given the job of weighing and releasing Swainson’s Thrushes. 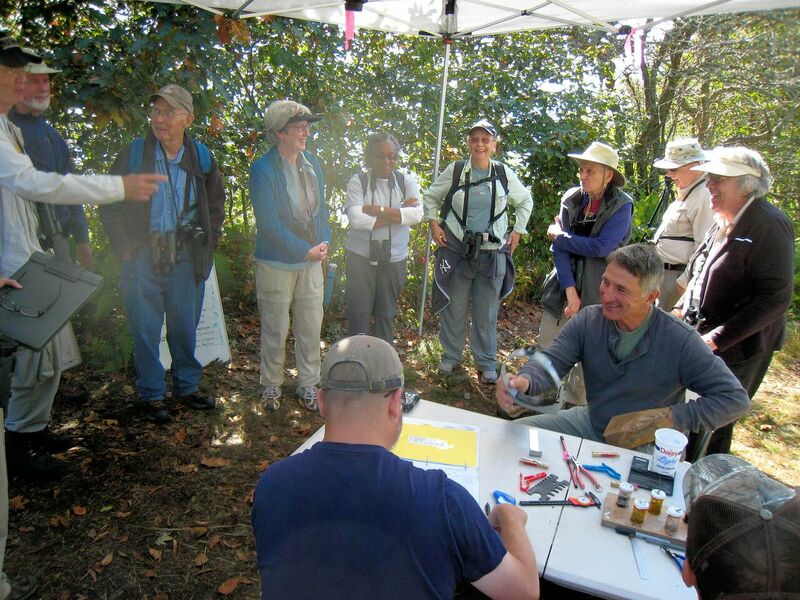 The Forsyth birders gathered around the banding table observing Mark and the other dedicated volunteers record valuable data that is used to monitor bird populations. 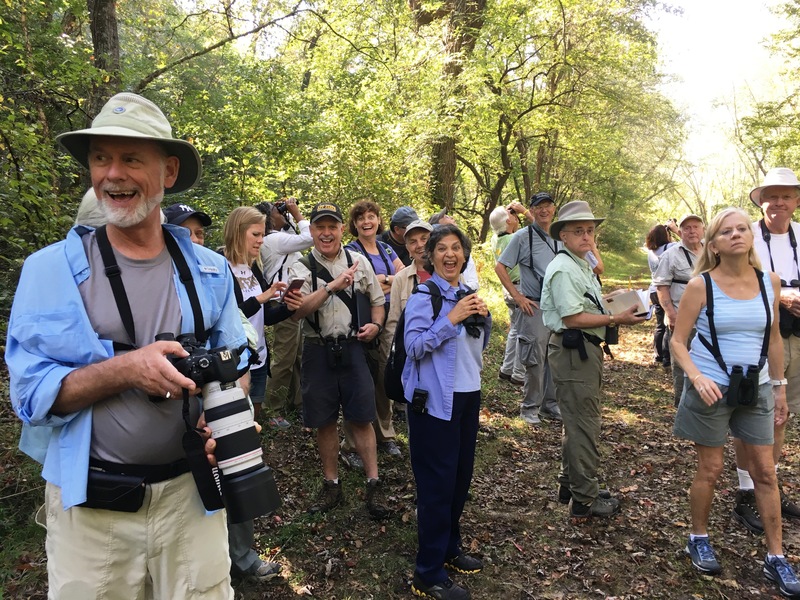 Forsyth birders have a tender spot in our hearts for the Wood Thrush and on this day we got to observe one at close range – in the expert hands of Mark Hopey. This Bay-breasted Warbler is a difficult bird to identify in the fall because of its similarity to Blackpoll and Pine Warblers. This bird has been banded and is ready for its flight to South America. It was hard to pull ourselves away because each time the volunteers returned from the nets with their little bags, it felt like Christmas! 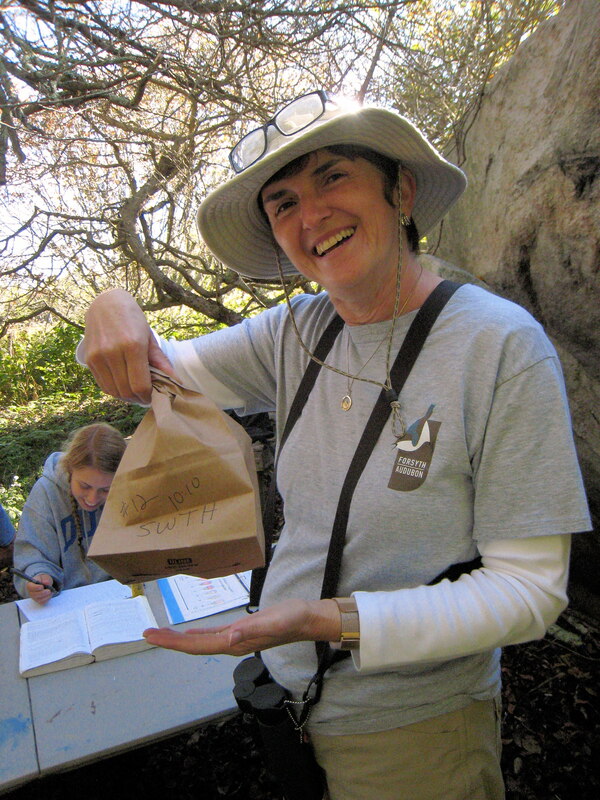 The bags kept the little birds safe as they awaited their turn for the banding and recording process. I think the group favorite was the little yellow and black Hooded Warbler. Clare’s favorite was the Yellow-bellied Sapsucker! The Gray-cheeked Thrush that was banded was a “life” bird for many, though since he was not “free”, we only put him on our “happy memory” list! Thanks to Mark Hopey, we each had a wonderful experience! David got to hold and release a Dark-eyed Junco! Around 11:30 AM, we hiked back down the bald to our camp at the gap for lunch. Once again, the day was warm. We had structured the day to be relaxing. We enjoyed a leisurely lunch; Shirley napped in the warm sun; Chuck enjoyed counting the migrating hawks from his comfy chair. Heather, Gail, and Nancy spotted a small flock of warblers which included a Tennessee (below) and a Nashville – the only one of the trip! 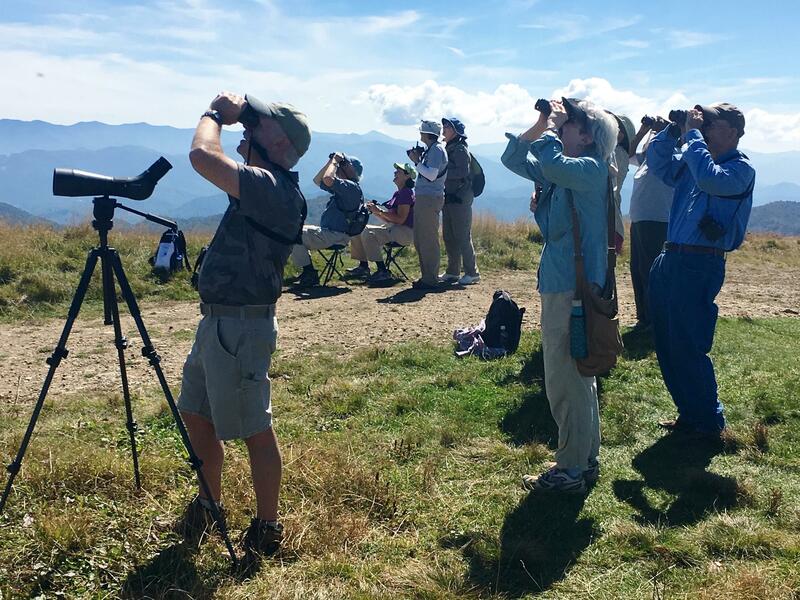 Many in the group hiked to Big Bald to participate in a migrating hawk survey. Rob used his scope to check out the raptors that passed overhead. We saw Broad-winged, Cooper’s, Sharp-shinned, Red-tailed, and Red-shouldered Hawks, and an American Kestrel. The hawk watching group counted for 2-1/2 hours up on that sunny bald! After the hike down the bald, we pretty much called it a day. A few remained, hoping that Mark would be able to capture a raptor. We gave up around 4 PM. Later we learned that he had caught two Sharpies around 4:15, about the time we were on our way back to the hotel. The Stack House Restaurant graciously opened its doors for us on Sunday evening for a dinner of burgers and deep fried delights like sweet potato fries, onion rings, and even dill pickles. 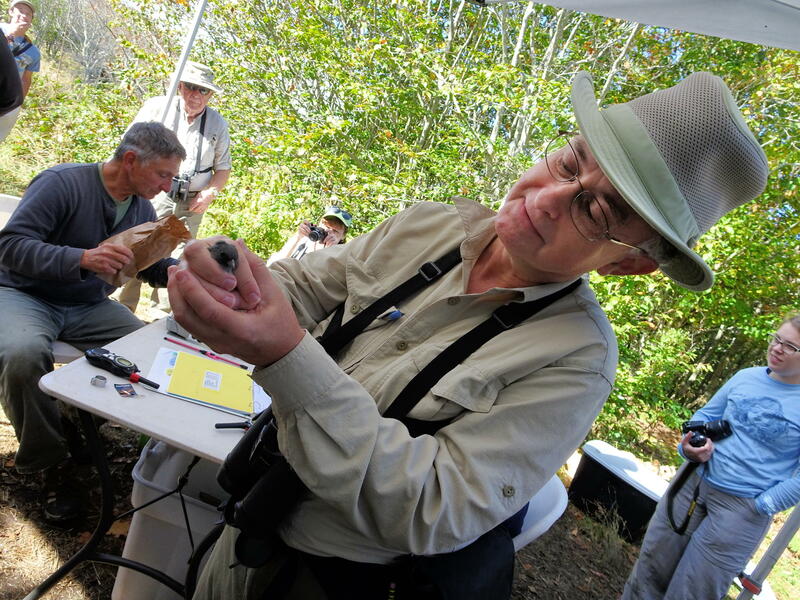 The traditional count-off of the checklist tallied 76 bird species. After adding the Monday birds, our trip total was 83 species seen! Most of us drove to Ridge Junction in the dark arriving around sunrise. The birds were everywhere – flying above our heads in their mad course south. 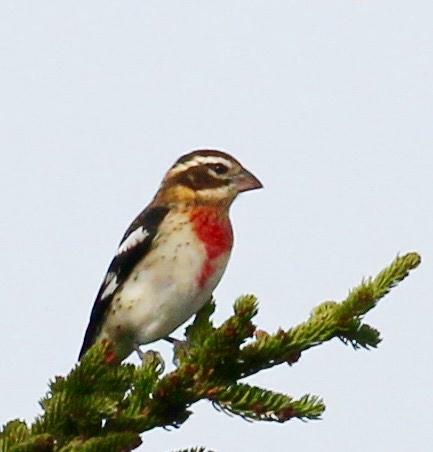 Even Red Crossbills – our target bird for the day – flew around but never landed within sight! 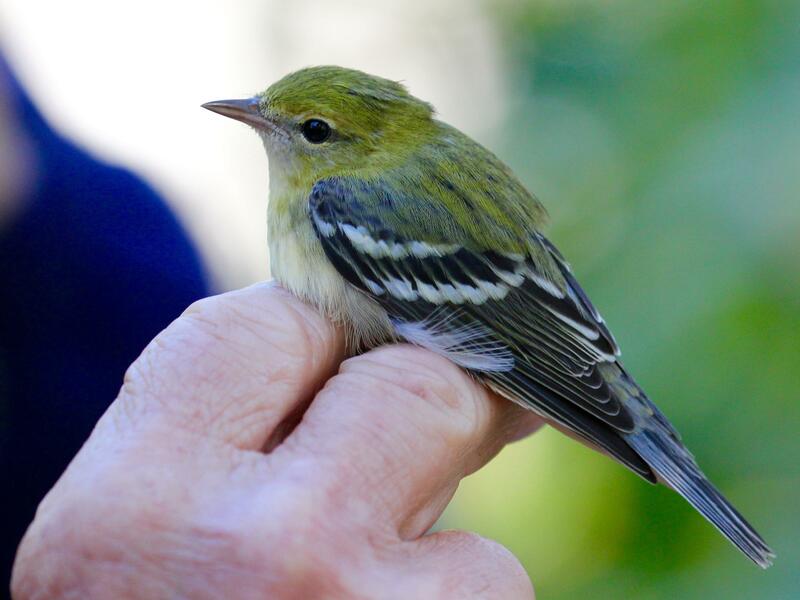 The warblers, vireos, and grosbeaks were all on the move, flying on the cold wind to their destinations. We were entertained by dozens of Red-breasted Nuthatches, squeaking along the Spruce tree branches! An unexpected look at a Golden-winged Warbler was our treat of the morning. We went to the top of Mt. Mitchell, hoping to see the crossbills, but saw none. After a parking lot picnic, we said our goodbyes. 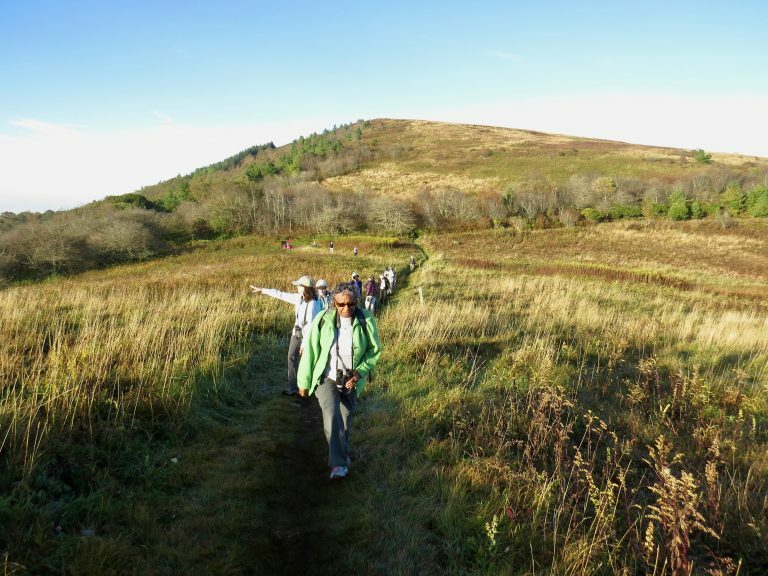 A few stragglers – acting on a tip – hiked down the Bald Knob Ridge Trail to a supposed hot spot for Red Crossbills. We got a good look at a few dozen of these crossed-billed birds eating pine cone seeds. Our only disappointment was that everyone did not get to see them! Next time!! Thanks to each of these trip participants! I had the best time ever enjoying the beauty of western North Carolina with these awesome people! Barb and Rick Borucki, Heather Moir, Don and Clare Adamick, Nancy Russo, Chuck and Cindy Thompson, Harry and Janet Rolison, Ga Baliga, Elnora Gore, David Shuford, Rob Rogers, Susan and Mark Andrews, Ferd and Gail Crotte, Judi Durr, Bob Dalton, Shirley Ferguson, Tim and Brenda Kilpatrick, and Pete Donaldson! Special thanks to Mark Andrews, Gail Crotte, Heather Moir, and David Shuford for allowing use of their photos in this post!